Lotería Nacional del Ecuador is the official national lottery entity. The biggest prize of the year is always the Christmas Lottery and is the most popular nationwide. My team was requiered to create an App to give a "Second Chance" to lottery buyers. I decided to use simple Augmented Reality to gamify the experience. Lotería Nacional (National Lottery Organization) wanted to give a second chance to win in every lottery ticket for the Christmas prize. The ticket would have a scratch-off game on one side, which would reveal a possible prize but also a bar code. So we decided to design an app that would read that barcode and, if it was a winner ticket, show surprise the user with a Brand New Flagship Smartphone for free. But I didn´t want it to end there, so we decided to reveal the proze through a simple Augmented Reality feature. The users would have a set of Christmas themed filters to apply on their faces (Snapchat style) and the prize would appear next to them. 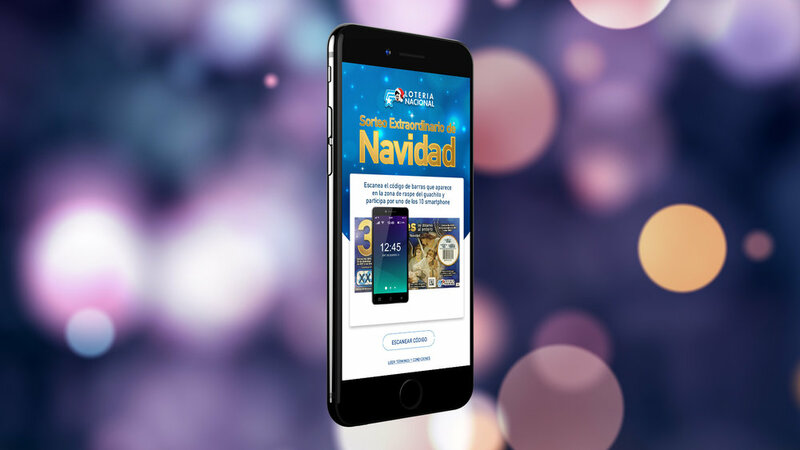 The idea of this was to give the user a shareable photo to show off their brand new phone the won thanks to Lotería Nacional for Christmas. We wanted the app to be appealing for the audience and to become a fun app to play with while participating in the Christmas Lottery. So I planned the project process with an important research and design iteration component, to make sure the app was usable, friendly and fun. We started by getting to know the different audiences, their habits, their needs and their expectations, but specially their relation and perception of Lotería Nacional. They turned out to be very close to the brand, a brand that inspired them hope and dreams. This helped us creating Personas that informed every future design decision. The users were part of every design and prototype iteration giving us insights and improving the interfaces. The prototypes allowed us to test the interfaces thoroughly and identify every single usability and functionality problem. We ended up with a robust prototype that worked perfectly with our audience before UI design or a single line of code. Now it was the time for the UI design and Development team to take over. Lotería Nacional had a very colorful and classic style in their communication, both offline and online. Even the printed tickets had some old-fashioned imagery, which was a long time tradition of the brand. We decided to keep some traditional elements but make the app look and feel like a modern Christmas app, that would appeal to both young and older audiences. The result was a modern, playful and pretty app that our users loved, used and shared all over the place.